Satisfy your craving for modern upscale fare in a stately setting. This nontraditional steakhouse offers internationally inspired dishes prepared with sustainably-sourced beef, seafood, and produce. 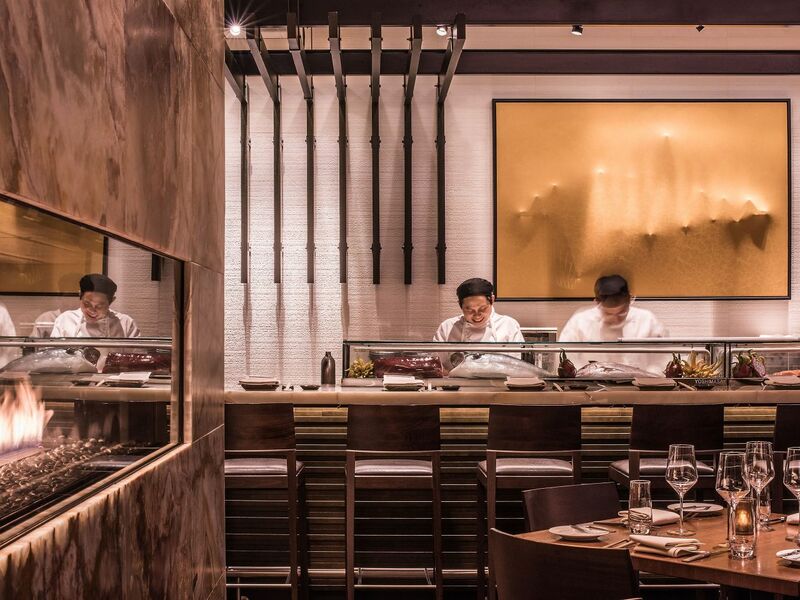 Enjoy the urban atmosphere with an open kitchen and energetic sushi bar, complemented by an award-winning wine program. Open every day 5:00–10:00 p.m.
Feast on locally sourced farm-to-table cuisine and handcrafted beverages in an open-air setting. Start the day with a hot breakfast buffet, including a made-to-order omelet station. 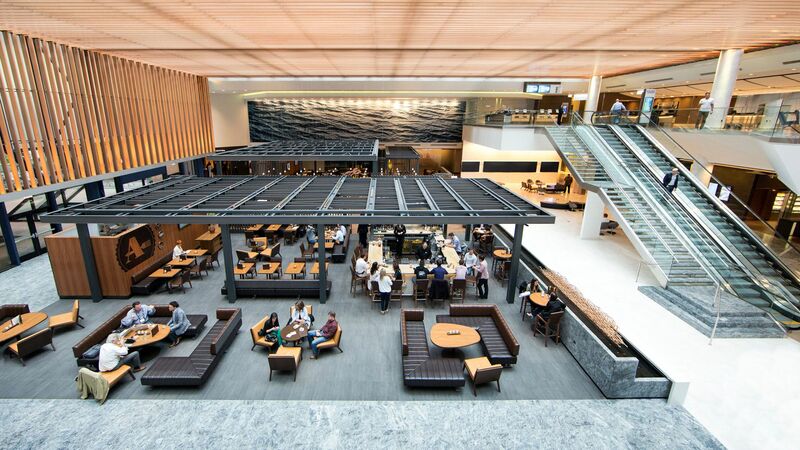 Slip away to the inviting and airy atrium for a taste of our passionately prepared American fare or try a sampling of local and select craft beers for a nightcap. 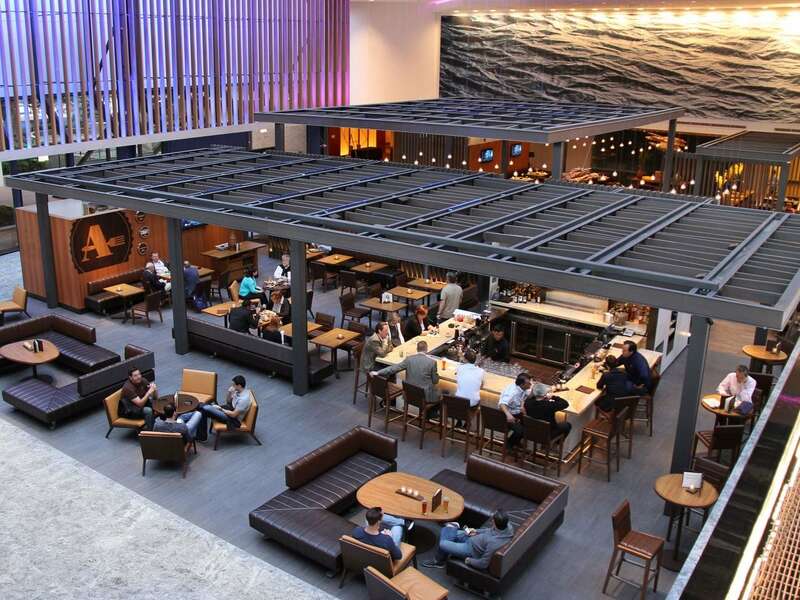 Enjoy locally sourced ingredients and innovative cooking techniques as you view the rotating art collection in this casual Chicago lounge. Sit down and enjoy a few favorites along with a beer, wine, or handcrafted cocktail. Wednesday, Thursday, 11:00 a.m.- 9:00 p.m.
Friday, Saturday, 11:00 a.m.-11:00 p.m. Grab a drink at this upscale mezzanine-level lounge, the continent’s longest free-standing bar. 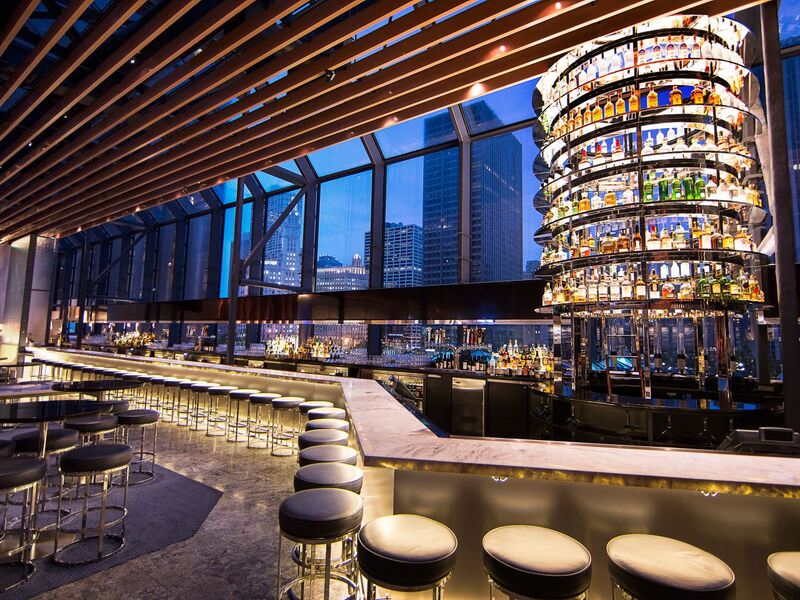 Revel in unparalleled views of downtown Chicago while sipping on beer or signature cocktails. Watch as the bartender scales the liquor tower to retrieve your libations. 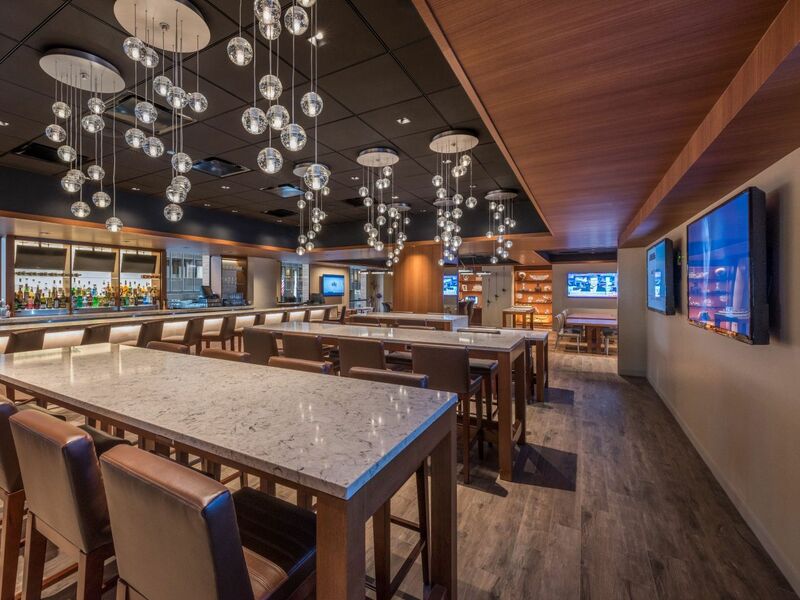 Sports fans can catch games on one of 24 flat-screen TVs, including two 90” screens. Mondays and Thursdays, 6:00–10:00 p.m. Hats prohibited after 9:00 p.m.
Stop by day or night for a cup of freshly brewed Starbucks® coffee or choose from a selection of gourmet sandwiches, fresh fruit, smoothies, pastries, and more. 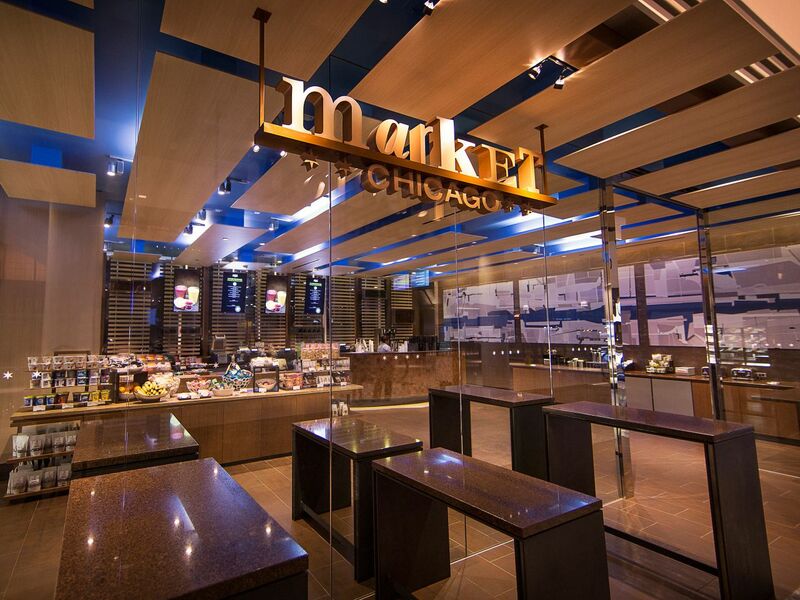 Market Chicago is the perfect place to start your morning or enjoy a late-night snack.